I love, love, love blueberries! I can eat them by the handfuls…literally. So, it shouldn’t come as any surprise that this blueberry coffee cake recipe would be at the top of my list of favorites. The best part (for me anyway) about this blueberry coffee cake is that it makes a 9×13 pan instead of the square 8×8 pan that many coffee cakes recipes call for. It would seem that – for that reason – it would last longer, but that’s not how it works. Not in our house anyway. 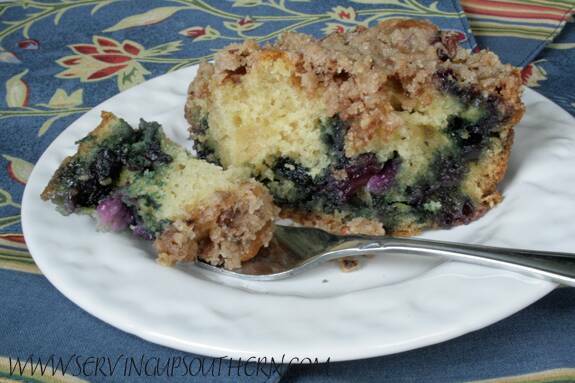 This might be more appropriately called blueberry streusel coffee cake because there is a streusel topping that gives it the perfect crunch in every bite. To get started you will need 1/2 cup of oil, 3/4 cup of sugar, 2 eggs, 1 cup of sour cream, 1 teaspoon of baking powder, 1 teaspoon of soda, 1/2 teaspoon of salt, 2 cups of flour, 1 teaspoon of vanilla, and 2 cups of fresh or frozen blueberries. First mix your oil and sugar together well, then add the eggs. Next, sift all of the dry ingredients together. 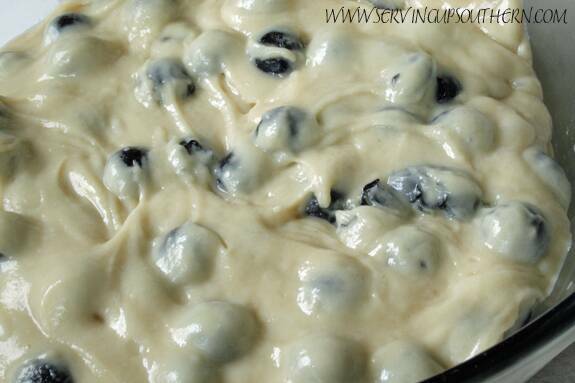 Add the dry ingredients to the egg mixture alternately with the sour cream, add the vanilla, then carefully fold in the blueberries. Once you’ve combined the streusel ingredients, sprinkle on top of the batter. Bake in a 350 degree oven for about 40 minutes. Do not over bake! This is sooo good served warm. Mix the oil and sugar together well, then add the eggs. Sift all the dry ingredients together and add to the egg mixture alternately with the sour cream. Add the vanilla and fold the blueberries in. Pour the batter into a well greased 9x13 inch pan. Combine ingredients and sprinkle on top of the batter. Bake at 350 degrees for about 40 minutes. Do not over bake! This is very good when served warm.